Stepping on board the 36.58m (120’) Touch is an unforgettable experience. Ideal for couples, families and friends, this chic motor yacht will delight your every sense. Her opulent interior is the epitome of luxury and comfort. Every detail has been embellished and meticulously designed, from the marble flooring, hand-blown glass, gilding, mahogany trim, to every fixture and accessory. Touch sleeps up to eight guests in four lavish staterooms. A separate owner’s deck features a gorgeous Lalique statement wall and is complete with a luxurious master suite, private spiral staircase and a private deck. Three stylish staterooms are distributed around an elegant foyer on the lower deck that is finished with a mosaic tile floor and an artisan crafted glass-lit wall. In each stateroom, guests will find inviting king sized beds, Swarovski crystal accents and unique one of a kind en suite baths. On the main deck, her sophisticated main saloon is the perfect space for pre-dinner cocktails at the bar, watching a movie or karaoke. Her formal dining room offers a delightful environment to enjoy a culinary experience prepared by Touch’s outstanding on board Chef who excels at French, Asian and Italian cuisine. 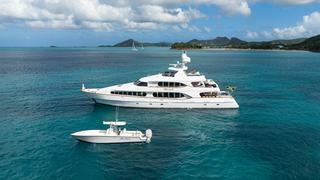 Touch offers impressive leisure and entertainment facilities making her the ideal yacht for socialising. Boasting three spacious decks, the main deck offers the most appealing spot to relax with a large eight-person Jacuzzi surrounded by plush sunpads. The sun deck hosts a large sun lounging area and a covered bar, perfect for fun in the sun, a party or simply just relaxing. Further sunbeds can be found on the foredeck, where guests can also enjoy music played via Touch's stereo system. Touch offers several excursions that will make your yachting experience unforgettable, from sport fishing and discovering hidden beaches, to unique beach lunches and snorkelling around some of the Caribbean’s finest coral reefs. She also comes well equipped with an impressive catalogue of water toys including a 34’ tender, Seabobs, kayaks, paddle boards, water-skis, a floating island, and more. The Captain puts his heart and soul into making sure every charter is unforgettable. The wonderful crew of seven go above and beyond to ensure guests receive exceptional luxury six star service.